A piece of R608 half the length of an R609. make Supersized seem small. An ideal way to extend your new train set or existing layout. 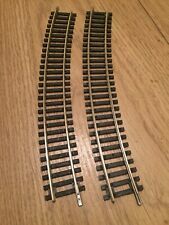 OO Gauge Hornby R608 Curved Track X 2 . Condition is Used. Dispatched with Royal Mail 2nd Class. Excellent quality nickel silver Hornby R608 3rd radius single curves x 2. No broken or missing sleepers, many as good as new. All very good conditioned fishplates in place. Length of arc is 505mm with 22.5° curve. Detailed scale model designed for adult collectors and is not intended for play. This product is not suitable for children under 36 months as it may have sharp edges and small parts. 3 x Hornby R608 Nickel Silver 3rd radius curves. 3rd Radius 505mm arc 22.5°. 1 x 3rd Radius Curve 22.5 Degree 505mm. This item is New and Unused. Add to Favourites. Catalogue number ST-230. Hornby R608 Curve 3rd Radius x 4 pieces. HORNBY R608 00 SCALE CURVE Used. Condition is Used. Dispatched with Royal Mail 1st Class Letter. Hornby R608 Single Curve 3rd Radius (OO gauge) No.3 Radius Standard Curve. 505mm Radius. 22.5 degree angle, 16 per circle. OO gauge Code 100. Interchangeable with Peco’s ST-230. No.3 Radius Standard Curve. Hornby R608 3rd radius curve 3rd-radius-curve. Should these circumstances arise, we will notify you. Buy now and save! © Hattons Model Railways. PICK UP OPTION. Caledonian Belle starter trainset with 0-4-0 steam loco in blue with 4 wheel coa. Four New Hornby R608 Standard Curve 3rd Radius, making a quarter circle. 6x R609 3rd Radius Double Curve. 4x R606 2nd Radius Curve. 2x R608 3rd Radius Curve. Hornby R608 Single Curve 3rd Radius x 2 pieces. In very good condition, appears unused. Hornby 00 Guage R608 Track. Condition is Used. Dispatched with Royal Mail 1st Class. 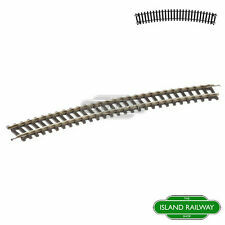 Hornby R608 Third Radius Single Curve Track Pieces Single OO Gauge 1:76 Scale. Condition is New. Dispatched with Royal Mail 2nd Class. 3 x Reference R628 For use with "Y" points (Radius 852mm - Arc 11.25). 1 x Reference R608 Single Curve 3rd Radius. The pieces are :-. Add to Favourites. Catalogue number ST-230. Hornby Railways R608 x 1 piece. Herpa Model Cars and Trucks are for persons of age 14 (Warning Small Parts). Herpa Wings are for persons of age 14 (Warning Small Parts). Scale - (gauge): 00 It is made from small parts Not suitable for children under 3 years 3rd Radius 505mm arc 22.5 degrees Handle with care . Authentic Hornby product. If you expand later, you can always add more. A perfect new addition to your Hornby Collection. 3rd Radius 505mm arc 22.5 degrees. Howleys Toys, 5 Frederick Place, Weymouth, Dorset.